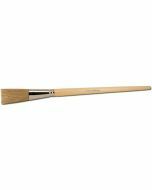 Iddings brushes are an ideal choice for students, teachers or professional scenic artists. These low cost scenic liners, or fitches, are carefully manufactured in the United States with long natural bristles to yield a smooth, even stroke. They can be used on a variety of stagecraft materials, including muslin, canvas, lumber and such non-porous surfaces as plastics and metal. Clean-upIddings brushes should be washed in warm (not hot) water immediately after use and rinsed until all traces of paint have been removed. They should be laid flat or hung by the handles for drying. Periodic cleaning of the brush head and soaping the bristles into place after cleaning will aid in maintaining its original shape, prolonging the life of the brush. 4.25" x 16.5" x 2.75"